Every once in a while you try to assign a particular address to a recipient in Active Directory Users & Computers, only to be told someone already has that address! Email addresses need to be unique — two recipients can’t have the same email address. Here are a few different ways to find out whether an email address is already used, and the recipient it belongs to. Create a new message in Microsoft Outlook or OWA, enter the email address and then press CTRL-K. If the recipient is not hidden from Address Lists/GAL, the email address resolves to the recipient’s Display Name. If the recipient is hidden from Address Lists, send a message to it and request a Delivery Receipt. The Delivery Receipt option is on the Options tab in Outlook. 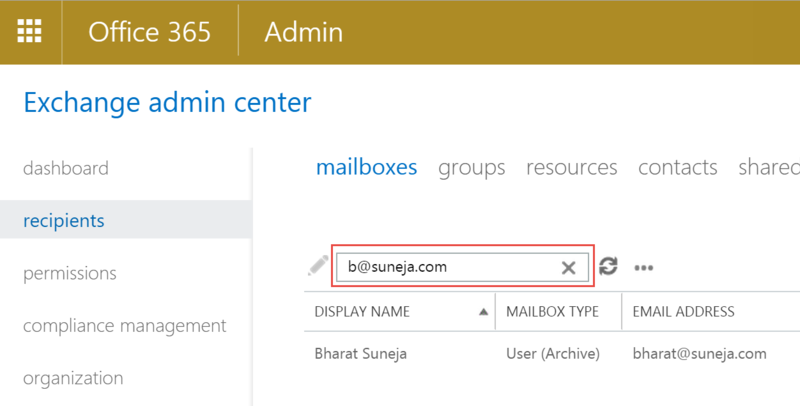 If you’re on Exchange 2013 or Exchange Online, you can use the EAC to easily search recipients. Go to Recipients > Mailboxes and type the address in the search box. The caveat, and the reason why this only counts as half – when you’re on the Recipients > Mailboxes page in EAC, you can only search mailboxes. To search other types of recipients such as distribution groups, you would have to navigate to the corresponding tab or page in EAC. There’s an Advanced Search option in EAC, but it also limits the recipient type (selected via a drop-down) to the page/tab you’re on. 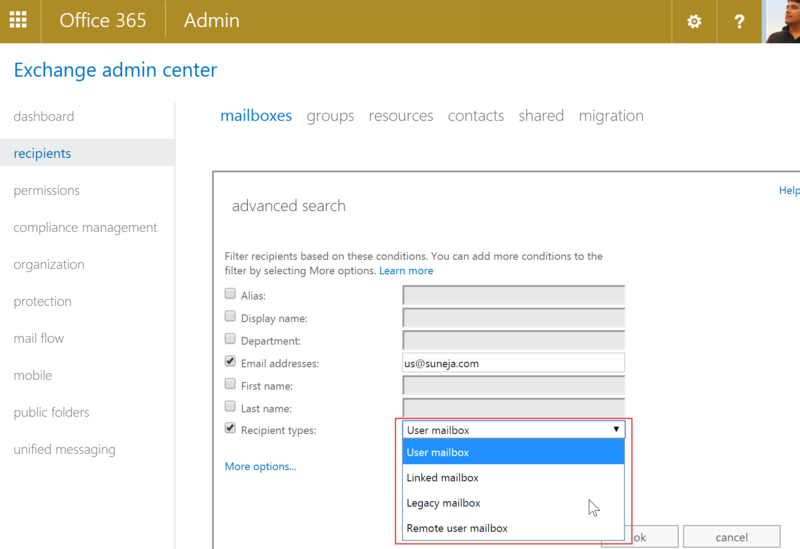 For example, if you’re on the Mailboxes tab, the available Recipient types options are user mailbox, linked mailbox, legacy mailbox and remote user mailbox. Similarly, on the Groups tab, the options are mail-enabled distribution group, mail non-universal group, mail universal security group and dynamic distribution group. Click here to see a Flash demo. Replace “dc=domain,dc=com” with your Active Directory domain name and suffix, and [email protected] with the exact email address you’re looking for. In the above example, only the name field is exported. All CSVDE/LDIFDE queries also return the object’s distinguishedName. To add more fields to the list, insert a coma after name and type new field names separated by a coma: e.g. Many thanks; a very useful tip! Very nice indeed, this saved me a lot of time – thank-you. Thanks! Option number 3 works a dream! We tried everything before checking your site. Option 3 solved our problem! Thanks. Thank you, LDAP query worked a treat! Would be helpful to have more discussion of wildcards – for example, Exchange handles duplicate email addresses by appending numbers to the end of the user portion of the address. I want to find all addresses that have been created this way – e.g. *[email protected] Searching on this in the Saved Query doesn't seem to work. Option 3 sorted my issue also! Bloody email address was assigned directly to a public folder :). I bet thats half the users who end up here’s problem too! & (choose) “Condition” & “Value”= smtp: (a part or the whole email address). I am hoping someone on here will be able to help. I am currently working on a task which requires me to clean up email lists in AD. I am having problems with people responding to me to let me know if they use a distribution list or not. Is there a way of checking in AD via script if an email has been used in the last 6-12 months ? Distribution list usage data is not stored in Active Directory. What you can do is search message tracking logs to determine if a DL was used recently. Logs are retained for 30 days by default, so it won’t meet your immediate needs. Some organizations retain logs for much longer, either on Exchange servers or (a little more commonly) archived elsewhere (fileshares, databases, log management tools, etc.). Third-party reporting tools also provide info about DL usage, including stale or unused DLs, but afaik most rely on mining message tracking logs. See Are Distribution Groups really being used?. I want to send and receive things via my email address? You may also use a tool such as my free version of AD report builder at sysmalogic.com to quickly get a list of users with their email address (and all their email addresses if needed).